Each year Gray Parks and Recreation organizes the Shoe Box Giving Drive. 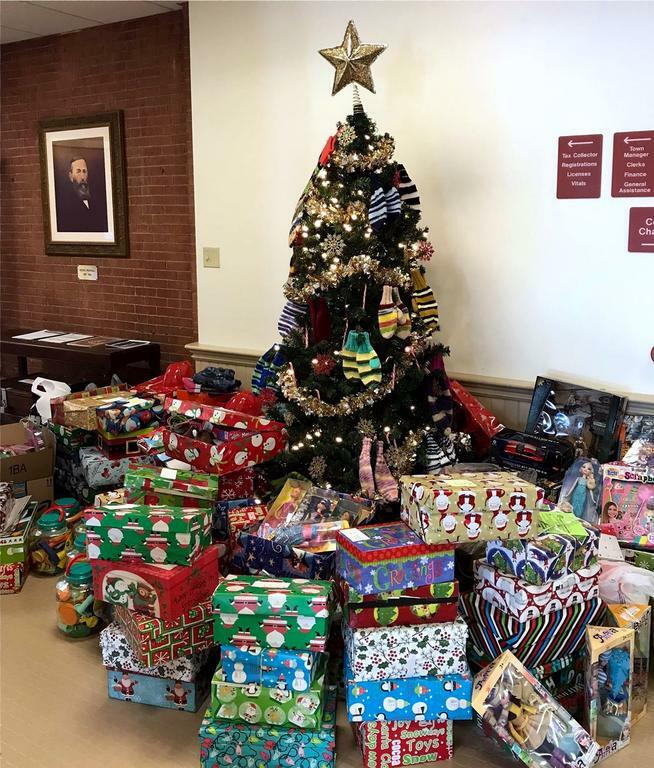 The Christmas tree at Gray Town Hall is surrounded by decorated and wrapped shoeboxes filled with small gifts and stocking stuffers for children to be distributed by Caring Community of GNG. Established in 1966, New Gloucester Santa is a Christmas Eve tradition that brings cheer and holiday spirit to young and old alike. On Sunday, Dec. 24, Santa is coming to town. He is stopping to bring goodies and visit with everyone at Thompson’s Orchard at 4:30 p.m., Town Hall at 5:30 p.m., and Upper Village near the town garage at 6:30 p.m. (times approximate). Organizers are requesting support from community members to keep this small town tradition alive. For more information and gift drop-off, call Lisa or John Kiley at 650-6630 or evenings after 6 p.m. at 926-5632. The First Congregational Church of New Gloucester, 19 Gloucester Hill Road, will hold its annual Christmas Eve Candlelight Service at 7 p.m., Sunday, Dec. 24. The evening will feature a traditional service of lessons and carols, anthems and candlelight, celebrating Jesus’ nativity. Those who wish may bring non-perishable food donations for the New Gloucester pantry. A fellowship hour in the vestry community room will follow the service providing a great place to catch up with friends and neighbors. Caring Community of GNG, a volunteer group organized in 2007 to provide holiday assistance for residents of Gray or New Gloucester who need support, will be distributing gifts for children 14 and under provided by a number of sponsors. Most recently, members of this charitable organization extend special thanks to the Memorial School in New Gloucester for collecting more than 100 toys and books, Gray Parks and Recreation for organizing the Christmas Shoe Box Drive filling more than 50 shoeboxes with toys and stocking stuffers, plus five Idexx employees who volunteered their time to help set up and organize the incoming gifts. A veterans’ adaptive cross-country skiing/snowshoeing program will be held every Wednesday from 9 a.m. to noon, Jan. 3 through March, weather and snow conditions permitting. It is free to all veterans with physical disabilities, traumatic brain injury and post traumatic stress. No experience is necessary. Ski instruction and equipment for skiing and snowshoeing are provided free of charge. All veterans who are interested in volunteering are welcome. Volunteer training is on Thursday, Dec. 28, and Sunday, Jan. 21, from 9 a.m. to 3 p.m. at Pineland Farms Outdoor Center, 15 Farm View Drive. The program, hosted by Pineland Farms’ Veterans Adaptive Sports and Training, is headquartered at the Outdoor Center. Learn a new activity or practice your skills with Army veteran, two-time Olympic biathlete and occupational therapist Kristina Sabasteanski. Interested veterans are asked to RSVP by Sunday of each week to kristina@pinelandfarms.org or 310-8694. For more information, visit pinelandfarms.org/recreation/VAST or check out their Facebook page: https://www.facebook.com/VeteransAdaptiveSportsTraining. On Thursday, Jan. 4, the Royal River Conservation Trust will sponsor a Rain or Shine Club hike at its Pisgah Hill Preserve. The preserve’s trailhead, with a parking lot for four cars, is located at 97 Dougherty Road. Overflow parking is available along the shoulder of the road. The RRCT invites everyone to join in on their free Rain or Shine Club guided hikes, conducted every Thursday at 10 a.m., to explore the trust’s preserves and trails. Check the schedule at www.rrct.org.